Hi, Attached is a photo of my German Shepherd puppy named Patsy. 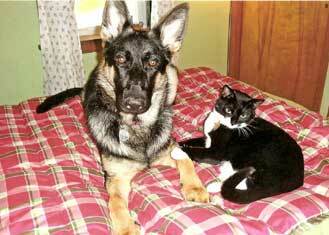 She is pictured with her sidekick, Kyle the cat. They are best buddies! I got Patsy when she was 8 weeks old from a wonderful breeder. Patsy is now almost 9 months old and continues to impress me each day. She is a wonderful, loving and playful girl. I am so lucky to have such a great pup! Some of her favorite things are playing with her toys, playing with Kyle the cat, going for rides in the car, hanging out in the yard watching the birds, going to our weekly obedience class and napping on the sofa. Her knickname is Pats. I really like this photo of her, it is so cute that Kyle has his paw on her leg. Hey there, Becky. I just love those pictures of Patsy - she is soooo cute! And I love the fact that her "sidekick" is a cat! Too cool! Thanks so much for taking the time to come here and share your German Shepherd pups story and pictures with us all today. Plus, it is a great photo of Patsy and Kyle.